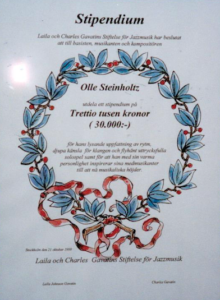 Basisten musikanten och kompositören Olle Steinholtz tilldelades 1999 ett stipendium från Laila och Charles Gavatins Stiftelse för Jazzmusik med motiveringen: "För hans lysande uppfattning av rytm, djupa känsla för klangen och flyhänt uttrycksfulla solospel samt för att han med sin varma personlighet inspirerar sina medmusikanter till att nå musikaliska höjder". Olle Steinholtz, despite his stunning technique, is a self-taught bass player. Born in 1948 he has an impressive list of credits as a freelance bassist, having accompanied many visiting American musicians to Sweden including Woody Shaw, Thad Jones and Charlie Mariano. He has also been a member of such groups as Egba, Tinto-mara, Nils Sandström´s Sextet, Steve Dobrogosz Quartet and of course E.E.E., Elise Einarsdotter Ensemble. In 1999 Olle Steinholtz received a scholarship from Laila and Charles Gavatin's Foundation for Jazz Music. With four CDs to their credit it would seem that E.E.E. is a formula that provides a perfect musical environment for Elise and Olle. However, there are many different ways of expressing oneself musically, and for many pianists, given the nature of their instrument, there are several who would gladly accept the challenge of making a solo album, should they be provided with that opportunity. In this case it was an initiative taken by Laila and Charles Gavatin after some discussions in the late summer 1997, and in January 1998 Elise and Olle came up with an inspired selection of both solos and duets. In fact there are some tracks on which Olle plays solo bass and it is to his credit that he succeeds in creating an almost orchestral sound on this large four-stringed instrument, most noted for its timekeeping role in jazz. One could wonder if there was a risk that they might run out of ways of surpris-ing each other nowadays. Elise replied: "It's almost essential that we should always keep searching for new things to say" and Olle added: "Perhaps even more impor-tant than surprising each other is the fact that we should still be able to surprise ourselves". Elise and Olle have toured with the ensemble in many different parts of Scandinavia and other parts of Europe e.g. England, Holland, Belgium, France and Yugoslavia. They have also played in Ethiopia, India, on the Faeroe Islands and in South Africa. These experiences are undoubtedly channeled back into their creative nature to give new dimensions to their playing and composing. Not only do Elise and Olle contribute to providing the rhythmic backbone of the Ensemble, but also they have found each other on a personal level, and are now married and have a young daughter. The CD, titled Sketches of Roses, was released in April 1998 (TMcCD 008).